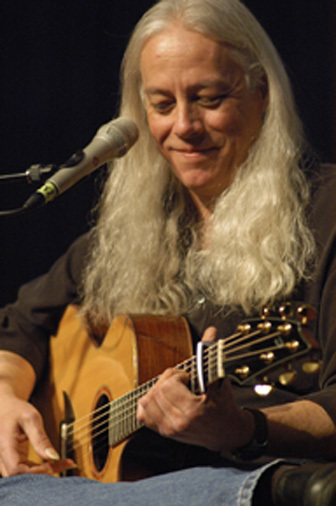 Performing on 6-string, 12-string, slide guitar or Acoustic Hawaiian Lap Slide, Gerhard captivates his audiences with virtuosity, generosity and sly humor. Known for his gorgeous tone and compositional depth, Gerhard can move a listener with a single note. Scott Alalrik of the Boston Globe said it best when he wrote ‘Gerhard does not write instrumentals. He writes songs only a guitar can sing. Based truly on the quality of his work, Ed built his considerable reputation, beginning with his debut album “Night Birds” in 1987. It garnered a spot in the Boston Globe Critics Poll Top 10 Albums of the Year.” Shortly after the album’s release, Windham Hill Records included Ed on its Guitar Sampler (Vol.1). One of the highlights of the three hundred thousand unit selling Sampler, “The Handing Down” introduced the world to the beauty of Ed Gerhard’s music. “That one piece made me a lot of friends around the world,” Ed says. Along with players like Ben Harper and David Lindley, Gerhard’s unique approach to the Weissenborn (an acoustic Hawaiian lap slide guitar) is playing a significant role in reinvigorating interest in this somewhat esoteric but beautiful instrument. Ed’s style of Weissenborn playing is unique in that he composes and arranges music for solo Weissenborn with beautiful melodies, complex chords and moving basslines, unusual for an instrument that normally serves an accompaniment role. Ed is featured in the book “Lap Steel Guitar” alongside legendary players like Greg Leisz, David Lindley, Jerry Byrd and more.